"Rashid Johnson: Message to Our Folks" was a solo exhibition on view at the Mildred Lane Kemper Art Museum from September 20, 2013 to January 6, 2014. 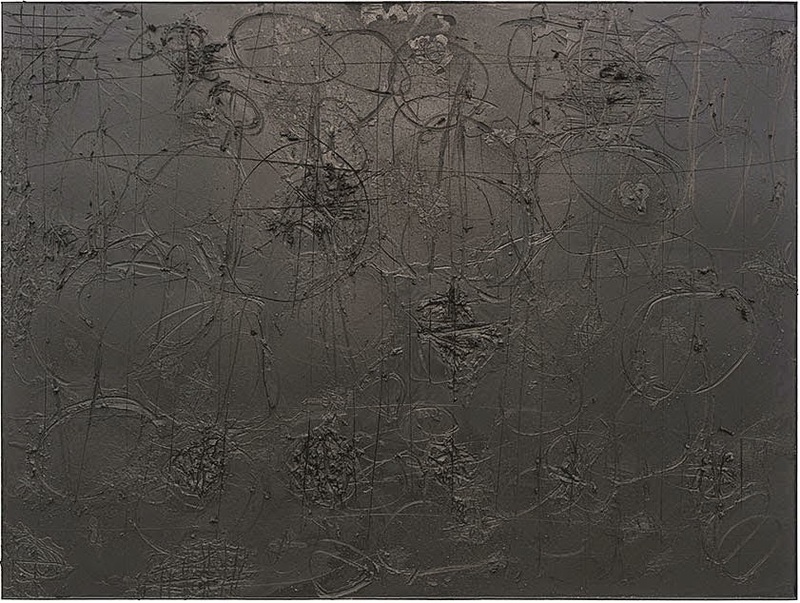 The gestural painting Antibiotic (pictured below) differed from neighboring works because of its massive size, minimalist approach, and seemingly arbitrary title. This case study on Johnson's use of medium and semiotics reveals how the artist explores the parallels between germaphobia and xenophobia. Although he is often identified as "post-black" artist, Johnson refuses to allow the contemporary era pass as “post-racial,” emphasizing the persistence of innate racist sentiments within the human psyche in the current age. Contemporary African-American artist Rashid Johnson (born 1977) seems determined to avoid generalized social commentary. As he says during the mini-documentary series Art 21: A New York Close Up, “I wanted to make something that didn’t necessarily speak to a problem.”1 Yet despite his demand for a strictly autobiographical read of his artworks, they nonetheless embody fundamental questions and motivations behind race relations in America that may extend beyond his personal lived experiences. Although he is often identified as a “post-black” artist, Johnson refuses to allow the contemporary era pass as “post-racial,” emphasizing the persistence of innate racist sentiments within the human psyche in the current age. 2 In the case of his painting Antibiotic (2011), violent swirling gauges in a monolithic black slab composed of black soap and wax purposefully evoke an abstract simplicity. And yet, simplicity only causes Johnson’s social commentary to become even more explicit. Through a deliberate choice of medium and semiotics, Rashid Johnson’s work Antibiotic sparks conversation on the striking parallels between germophobia and xenophobia. Rashid Johnson, Antibiotic, 2011. Black soap and wax on board, 108 5/8 x 144 3/4 x 4”. Collection of the artist and Evan Boris. Photo by Nathan Keay, © MCA Chicago. During an interview, Rashid Johnson recalled that the first artwork that held meaning for him was encountered during his childhood in the form of a large, abstract expressionist painting by Clyfford Still (born 1904) that was painted almost entirely black except for a thin stripe of brown.3 He found the adjacent curatorial interpretation of Still’s work highly problematic, that this lighter brown color amidst an ocean of blackness communicated an expression of hope in dark times. In Antibiotic, he explores this subconscious unease associated with the color black. Contrary to many of his other works that use mirrors to include the viewer in the artist’s experience, Antibiotic deliberately excludes the viewer in a confrontational, unapologetic depiction of blackness. Johnson’s painting could even be interpreted as a revisionist depiction of the Clyfford Still painting from his youth, extending black as the dominant color to force a reevaluation of its implications. His monumentally sized scrapings have a dominating, looming presence, as Johnson forces the viewer to confront the irrational anxieties associated with black as a color. The very title, Antibiotic, forces the viewer to contemplate the painting within the context of the medical term for a treatment designed to inhibit the growth of or proliferate the destruction of germs and bad elements. This thus manifests the question, what is the “bad element”? This instinctively forms a parallel to the racial struggles in urban America, drawing similarities between the anxiety over racial purity and the fear of illness. The interaction between medicine and unwanted microorganism recalls the persecution of the African-American race in America, the residuals of which Johnson would have undoubtedly felt growing up in urban Chicago during the 1980s. As a child born during the decline of the 1970s Afrocentric movement, he witnessed the slow diminishing of cultural pride within his family in practicing traditions such as Kwanzaa and African dress.4 What Johnson and his family experienced was cultural conformity, as the dominant culture subsumed and extinguished the lesser other. Within Antibiotic, this process of assimilation is appropriately compared to a kind of eugenics, with the bacteria-ridden human body serving as a microcosm for Johnson’s perception of American society and interaction between different ethnicities. However, although medical sciences are founded under the premise of objectivity and logic, ideas of racial purity and xenophobia were nonetheless fueled by the irrational. Thus, the comparison formed between the African-American race and sickness emphasizes the irrationality of racial prejudice and intolerance. Moreover, the melancholic mood of the work emphasizes the detriments of racial purity and abolishing diversity. Catalysis III, 1970 by Adrian Piper. In Catalysis, she used her body to draw attention to the fear of racial impurity embedded within society. As she rode the public transit system with a rag gagging her own mouth, the reactions from strangers were as much an indispensible part of the artwork as her performance. 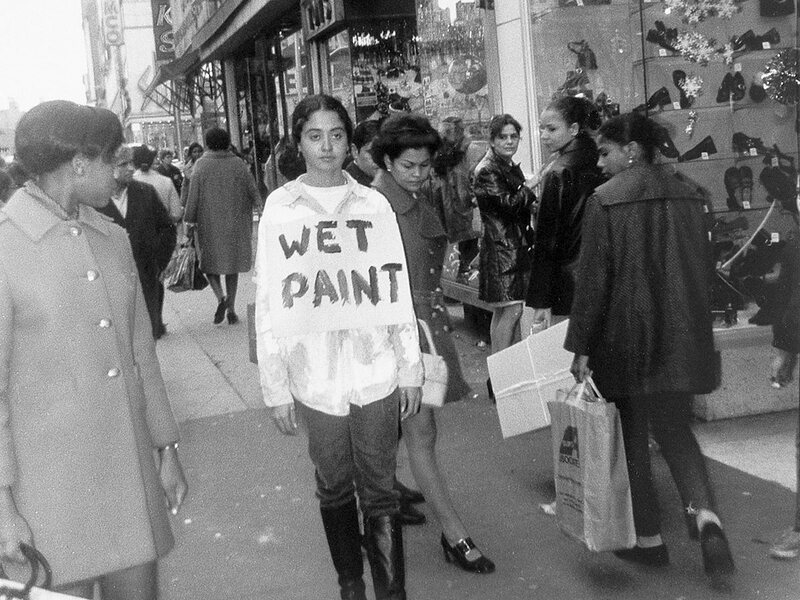 Her alterations of her body, which included walking through the streets of New York with “Wet paint” dribbled on her chest or wearing a t-shirt reeking of spoiled eggs and vinegar, forced comparisons between her mixed-race ethnicity and the oddity of her actions. The crowds parted in order to avoid contact with her body. Individuals either eyed her abnormalities with a mix of curiosity and disgust, or faced away from her altogether to avoid confrontation. Society’s revulsion at her actions evoked a sense of how a person’s ethnicity might render them an outcast and undesirable. Her work similarly challenged viewers to accept personal responsibility for their unwarranted xenophobia and discrimination.6 In Catalysis, the stigma attached to being a member of a minority race was compared to being feared as an unhygienic pollutant in an otherwise homogeneous society. In Johnson’s work, the audience participation is arguably also just as much part of the artwork as the artwork itself. Figuratively speaking, part of the art consists of audience interpretation, and the artist activating the viewer by asking for an interpretation of color. Similar to Piper’s work, Johnson laments the defects in human perception and highlights the prejudices resulting from inherent human desire for cleanliness. Using a sharp tool to carve deep, swirling lacerations into the originally malleable medium, Johnson attempts to disguise the actual medium – soap – as something else entirely. Given its monolithic black color, the thick, greasy, viscous nature of the painting may evoke tar or asphalt. The surface is dotted with splatters, and bits of residue form abstract shapes that could be mistaken for debris or exposed rebar. This captures the dirt and grime of an urban landscape. The ironic “dirty” aesthetics of an otherwise “clean” medium anticipates that the viewer will wrongly interpret the work, and the discovery of the real medium subsequently incriminates the viewer for an immediate conflation of the color black with unsanitary. The work is thus a test of implicit associations, revealing hidden biases in human judgment. In conducting an experiment on how viewers respond to blackness, Antibiotic challenges viewers to accept personal responsibility for the history of racism in the United States. The most mysteriously captivating component part of Antibiotic is thus the medium itself. Thus, what his work ultimately delves into the semiotics of his medium. Johnson de-familiarizes an otherwise familiar, domestic item in choosing to use West African black soap rather than its typical representation within American culture as white. This forces the juxtaposition of two apparent paradoxes embedded in American society: soap as a symbol of cleanliness and blackness as a symbol of pollution, fear, and danger. In its references to racial struggles in America, this process of how the viewer identifies the medium in his artwork mimics the wrongful criminalization of the African-American community by using race as justification for persecution. Historically, skin color in America both allowed certain individuals within society to be elevated, while others were disadvantaged. If Antibiotic explores the negative connotations associated with the color black, such as uncleanliness and unwanted refuse, it also compares the feeling of blackness with a sort of terminal illness. The work can be read as an autobiographical expression of self-consciousness and self-awareness. The surface of the soap and wax mixture evokes the oily sheen of human skin. The rapid, repetitious scratching motions communicate an obsessive attempt to rid the surface of its original smooth quality. This cringe-inducing texture, highly evocative of self-mutilation, captures feelings of hopelessness, shame, and historical weight of associating with blackness. Despite swirling, meditative scrape marks that gouge deep into the medium, distinguishing marks fail to cause a change in the perception of the board as mono-colored. A tool has been used to carve deep cavities, but the layers underneath do not change in tonality. If anything, it reinforces the solid homogeneity of the medium. The process is an exercise in futile, as if no amount of cleaning can make the color disappear. However, the final product is truncated into a rectangular shape, perhaps in complacent acceptance or as a monumental memorial. Bordowitz, Gregg. General Idea: Imagevirus. Afterall Publishing, 2010. Bowles, John P. Adrian Piper: Race, Gender, and Embodiment. Duke University Press, 2011. Conrad, Peter. The Medicalization of Society: On the Transformation of Human Conditions into Treatable Disorders. JHU Press, 2008. Fee, Elizabeth, and Daniel M. Fox. AIDS: The Making of a Chronic Disease. University of California Press, 1992. Gellner, Uwe. Rashid Johnson: Sharpening My Oyster Knife. Bielefeld, Germany: Kerber Verlag, 2009. Golden, Thelma, Christine Y Kim, Hamza Walker, Franklin Sirmans, and Studio Museum in Harlem. Freestyle. New York, NY: Studio Museum in Harlem, 2001. Hicks, Cinqué. “What Is Afrofuturist Art?” San Francisco, CA: Patricia Sweetow Gallery, 2004. Julie Rodrigues Widholm. “Rashid Johnson: Message to Our Folks.” In The Moment of Creation. Belgium: Die Keure Press, 2012. Levy, Peter B. “Dream Deferred: The Assassination of Martin Luther King, Jr., and the Holy Week Uprisings of 1968.” In Baltimore ’68â€¯: Riots and Rebirth in an American City. Philadelphia: Temple University Press, 2011. Muhammad, Khalil Gibran. The Condemnation of Blackness: Race, Crime, and the Making of Modern Urban America. Cambridge, Mass. : Harvard University Press, 2010. Rashid Johnson Makes Things to Put Things On. New York Close Up. Art21, Last modified 2011. http://www.art21.org/newyorkcloseup/films/rashid-johnson-makes-things-to-put-things-on/. Reed, Rodney J. “History of the Boulé.” Sigma Pi Phi Fraternity, n.d. Accessed November 21, 2013. Rashid Johnson Makes Things to Put Things On, New York Close Up. Art21, last modified 2011, http://www.art21.org/newyorkcloseup/films/rashid-johnson-makes-things-to-put-things-on/. Thelma Golden, Christine Y Kim, Hamza Walker, Franklin Sirmans, and Studio Museum in Harlem. Freestyle. (New York, NY: Studio Museum in Harlem, 2001). Uwe Gellner, Rashid Johnson: Sharpening My Oyster Knife (Bielefeld, Germany: Kerber Verlag, 2009). Julie Rodrigues Widholm, “Rashid Johnson: Message to Our Folks,” The Moment of Creation (Belgium: Die Keure Press, 2012), 29. Peter B. Levy, “Dream Deferred: The Assassination of Martin Luther King, Jr., and the Holy Week Uprisings of 1968,” Baltimore ’68: Riots and Rebirth in an American City (Philadelphia: Temple University Press, 2011), 3-25. John P. Bowles, Adrian Piper: Race, Gender, and Embodiment (Duke University Press, 2011), 5. Rodney J. Reed, “History of the Boulé,” Sigma Pi Phi Fraternity, n.d. accessed November 21, 2013, http://www.sigmapiphi.org/home/history_of_the_boule.php. Cinqué Hicks, “What Is Afrofuturist Art?” (San Francisco, CA: Patricia Sweetow Gallery, 2004). Elizabeth Fee and Daniel M. Fox, AIDS: The Making of a Chronic Disease (University of California Press, 1992), 253. General Idea, "General Idea's Pharma©opia," General Idea: Pharma©opia (Barcelona: Centre d'Art Santa Monica, 1992), 61. Khalil Gibran Muhammad, The Condemnation of Blackness: Race, Crime, and the Making of Modern Urban America (Cambridge, Mass. : Harvard University Press, 2010). Peter Conrad, The Medicalization of Society: On the Transformation of Human Conditions into Treatable Disorders (JHU Press, 2008), 4. Thelma Golden, Christine Y Kim, Hamza Walker, Franklin Sirmans, and Studio Museum in Harlem. Danielle Wu graduated in 2014 with a Bachelors degree in Art History from Washington University In St. Louis in St. Louis, MO.